Dog rose or rosa canina is a deciduous shrub with thorny stems in the rosa genus. It is fairly similar to the apple rose or rosa rugasa and like most rose species, the dog rose has five-petalled flowers. Dog rose is native to western Asia, northwest Africa and Europe, which means it can also be found growing all across the UK. 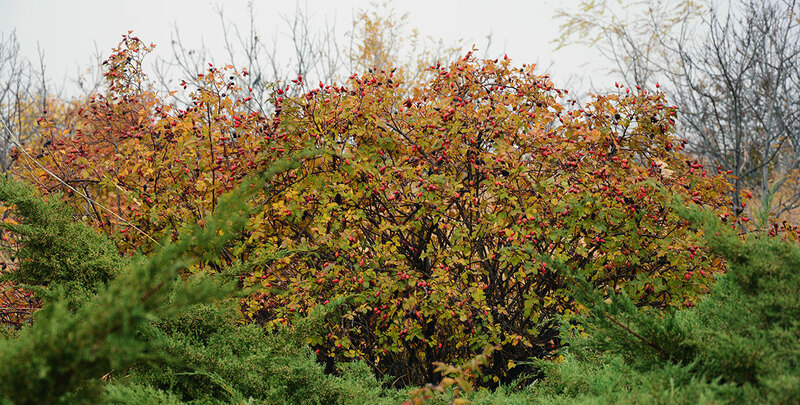 Being a native species with wildlife interest, it is often seen in mixed country hedges, in which it is typically combined with other useful native species, such as hawthorn. Dog rose is very undemanding and can be grown by anyone who wishes to do so. Even inexperienced gardeners should be able to grow a dog rose hedge and enjoy its beautiful flowers. Dog rose has large leaves and lightly fragrant flowers in the summer, which often remain on the plant well into the autumn. The abundant flowers that are produced in early summer are usually a pale pink, but their colour may range from a pure white to a deep pink. 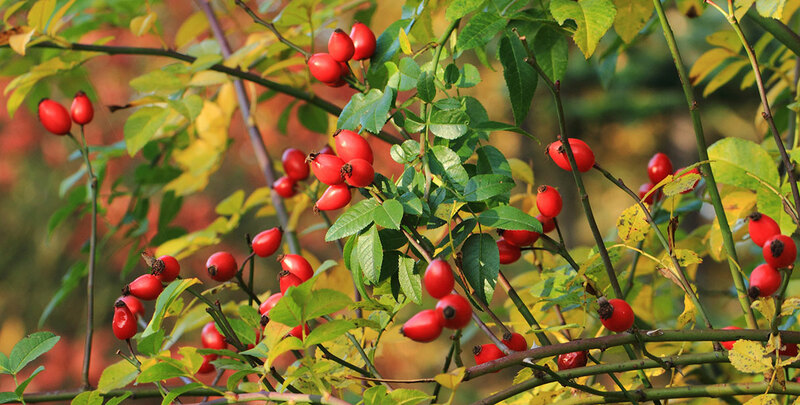 In the autumn, these flowers are replaced by small, red, ovoid fruits, which are also known as “hips” or rosehips. These fruits are attractive to birds, but they care also characterised by their high vitamin C levels. They can be picked to make tea, marmalade or a tasty rosehip syrup. These bright red berries also add some colour to your dog rose hedge, while its small, sharp thorns keep intruders like grazing animals at a distance. Not only the English name ‘dog rose’, but also its Latin name – which literally translates to dog rose – refers to the fact that it was considered to cure people who have been bitten by rabid dogs. 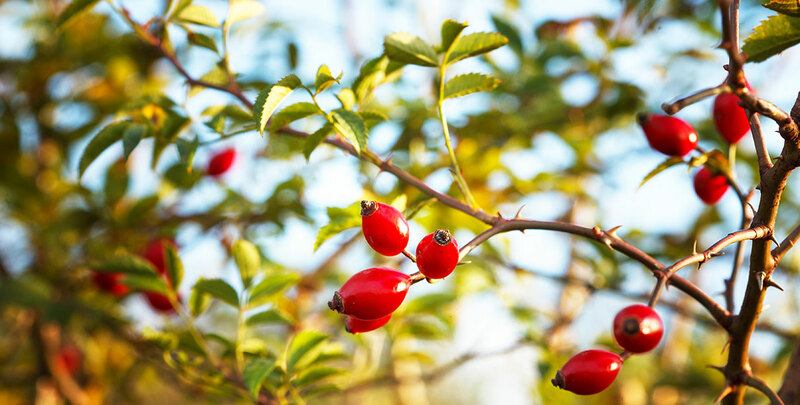 For some plants, their supposed healing power is merely superstition, but since the fruits of the dog rose are rich in vitamin C, they are certainly beneficial to one’s health. Dog rose is widely grown for this reason, especially when vitamin C is in short supply otherwise. In addition, the fruits are traditionally used as a natural sweetener. The taste of these berries is still appreciated to this day, as they are still commonly used in syrups and even sodas all over the world. As its fruits are not only tasty, but also brightly coloured, the history of dog rose as an ornamental plant also goes back quite a long way. 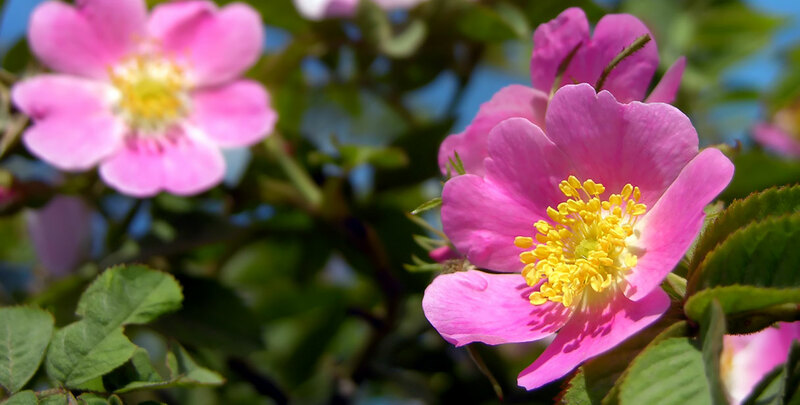 Naturally, its beautiful flowers are part of the reason why dog rose is a beloved ornamental plant as well. Dog rose makes tall, wild hedges and while its thorns are too small to make a proper intruder hedge, they will certainly keep grazing animals away from its leaves. Bird enthusiasts often plant a dog rose hedge in their garden, as birds like to eat rosehips and build their nests inside this type of hedge. Of course, you can also decide to keep the fruits yourself, but the birds will really appreciate it if you leave at least a few hips on. A hardy and tough native shrub, dog rose makes vigorous, fast-growing hedges that require very little attention. It will grow anywhere, except on waterlogged sites, although it has a preference for humus-rich soils. Dog rose hedges are happy growing in the full sun or partial shade. It can handle exposure to wind and coastal positions and will grow a tall, impenetrable hedge in virtually no time at all. As a component of a mixed hedge, dog rose can reach a height of up to about 3 metres, while a dog rose hedge on its own can grow up to 1.50 metres in height. The flowers will appear in June and July, after which the rosehips will appear. A dog rose hedge is usually planted during winter or springtime when bare root plants are available. There are no disadvantages to using small plants, considering that dog rose will make a full-grown thicket fast. Dog rose is very inexpensive and is probably one of the most cost-efficient ways to create a secure barrier hedge, be it by itself or as part of a mixed hedge. Light formative pruning can be done anytime in September and November. Hard pruning is neither necessary nor beneficial, though it is recommended to cut it back a little in early spring to make room for other plants. Make sure to wear some high-quality gloves when you choose to trim your dog rose hedge, as its thorns will easily penetrate fabric. If you are looking for the maximum amount of ornamental value for the minimal amount of money, dog rose is the right hedging plant for you. They also require very little maintenance, as minimal maintenance will only help emphasize their amazing wild, informal look. Its appearance is not the only benefit of having a dog rose hedge in your garden though, as its brightly coloured rosehips taste fantastic and are a great source of vitamin C. Birds will also look forward to visiting any garden with a dog rose hedge and therefore, we recommend bird enthusiasts not to keep all the rosehips for themselves, but also keep a few to feed their feathered visitors. In addition, the flowers that grow on a dog rose hedge in June and July are elegant and have a pleasant, subtle scent. Combined with its limited demands in terms of locations and soil type, dog rose hedges are an excellent choice for just about any garden or farmstead.